I am a father of two beautifully vibrant boys and a devoted husband as well as being a musician, performer, TV commercial recording artist and an accomplished studio-recording artist, and have recorded on over 8 albums with internationally renowned artists. I am also a music and dance educator, and am committed to inspiring youth and adults to connect to music and movement. I have been performing at school assemblies and teaching music and dance throughout Los Angeles, Michigan, Australia and New Zealand for over a decade. In June of 2011, we moved our "clan" to Nevada City, Ca. and feel very blessed to have made the move to such a wonderful community and spectacular "stomping ground". I began playing music as a youngster with the trumpet; and years later moved onto the drums and percussion instruments; my earliest inspirations were Neil Peart and Stewart Copeland and later was exposed to all types of approaches to rhythm. After attending college in Chicago (where I received a degree in Film and Video Production), I then moved to Los Angeles where I connected with a local Latin Jazz ensemble that embraced the deep rhythms of Afro-Cuban percussion...it was at this time that a friend and band mate introduced me to the Didjeridu. I was immediately inspired to learn more about the Aboriginal Australian Culture, and more specifically the Yolngu, from which this instrument holds its origins. 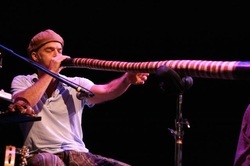 My connection to playing the Didjeridu and my fascination with its complex sounds and rhythms led me to a three and a half year journey to Australia, New Zealand and Tonga. It was on this journey that I realized the importance of being Caretakers of our Environment and Community and that moving from within, honoring rhythm, song, dance and storytelling with one another is vital to being alive on this planet. The music, storytelling and connection to the natural world of all indigenous cultures are a deep and constant inspiration for me and manifest in the InDidjInUs Kids music and dance program. 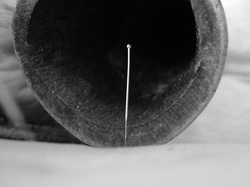 I began my exploration into sound and music as therapy with didjeridu's in 1996. I was invited to play didjeridu at a summer day camp for children from unstable families. When I was packed and ready to go, a couple of the counselors came to me and stated quite frankly that they have never seen these children so happy, as a result of me playing. From that point on, I came to recognize the therapeutic affect that sound from this instrument and how I played it had on the body and spirit. During my 3-year journey to Australia and New Zealand I developed a music and dance program for children and adults of all ages called In-Didj-In-Us Kids, and also did profound sound therapy with the didjeridu on special needs clients as well as pain management and acceptance processing on cancer patients. As my experience and education developed with sound therapy, I also realized the importance of movement as being an important factor for healing so I was drawn to playing didjeridu as a musical accompaniment in bands. I've since recorded and played with RaRa Avis; Craig Kohland and Shamans Dream; Shannon Terry and The Open Door Orchestra; Suzanne Teng and Mystic Journey; and Jacqueline Fuentes. I currently have a trio called "The Breathe Deeplies". For the past three years I have had the honor to co-create a healing sanctuary with my wife Anna who practices Chinese medicine and herbology, with both chinese and local herbs. HarmonicAcupunture is our work together along with raising our two wonderful boys. I've taught my music and dance program in schools throughout Los Angeles and currently teach at New Roads Middle School and Malibu Methodist Nursery School. In the works is a CD composed of therapeutic healing frequencies of the didjeridu for National Association For Child Development - NACD.